I’ve been getting a lot of calls about Bumble Bees recently, probably half a dozen so far this season. In comparison, last year I got maybe five calls total about Bumble Bees. I’m not sure if the particular weather we have been having has been favoring the Bumble Bee population, or if my website is currently scoring high for hits on “Bumble Bee Removal Seattle”. Personally, I really like Bumble Bees. They are big, fuzzy, fun to observe, and generally rather docile, not aggressive at all. They are also excellent pollinators, second only to Honey Bees. We have this shrub in our front yard, which when it blooms has these intensely purple flowers – the Bumble Bees just LOVE it. I hardly ever see Honey Bees in it, but on a nice sunny day there can easily be a thousand Bumbles buzzing all over it. Last year, I exclusively encountered Yellow Faced Bumble Bees (Bombus Vosnesenskii) on removal jobs. Those guys are jet black, except for a yellow stripe across their face, so they look pretty mean and scary. They tend to nest in piles of dried old leaves or other yard debris, and when the homeowner decides to move the material, they get startled and start buzzing around. People often mistake them for hornets or anything else but a Bumble Bee, so they want them removed. The way I remove Bumble Bees is by capturing them alive using the bee vac, gathering up any brood I can find and some of the nest material, and re-locate them either to my back yard or a nearby forerst. Bumble Bees don’t make wax comb, nor do they produce honey in any large quantities. Instead their egg cells look like waxy clusters of peanuts. Each cluster has an associated “honey pot”, a small wax container filled with honey. This season, it have done three Bumble Bee removals so far, and they have all been either Tricolored Bumble Bees (Bombus Ternarius) or Orange-Rumped Bumble Bees (Bombus Melanopygus). They look a lot more what people expect a Bumble Bee to look like. 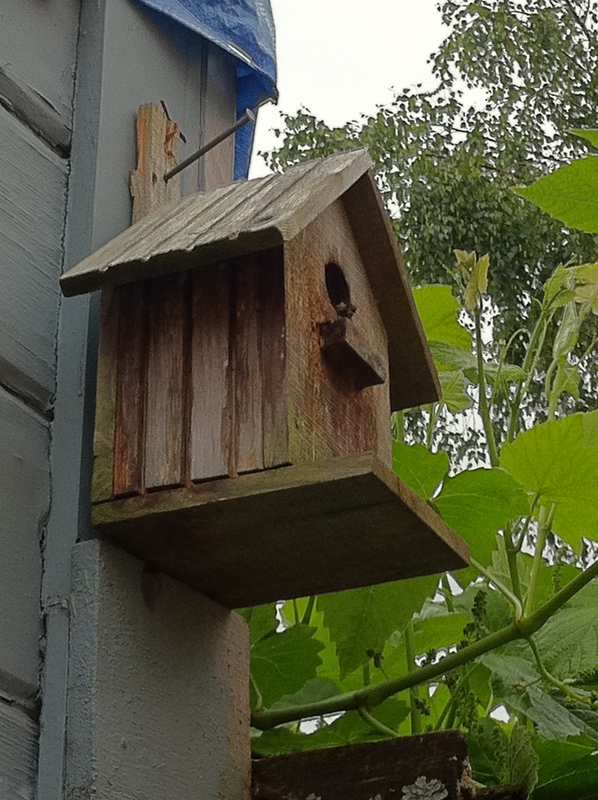 Those guys seem to prefer old bird houses to make their nests in – two of the removals involved bird houses, only one was a nest in an old grape arbor. The occupants of one of the bird houses seemed a lot more aggressive than all my previous encounters. As soon as I got within a few feet of the entrance, I got buzzed by several guard bees. The property owner just let me haul away the entire bird house, Bumble Bees and all, so the removal itself was pretty straight forward. When I got back home, I decided to simply attach the small structure to the side of our garage (see picture above), up high enough so the Bumble Bees should not bother anybody. Somehow I decided that I didn’t need to wear gloves when I opened the lid of the 5 gallon bucket I had transported the birdhouse in. Big mistake – one of the guards had gotten out and immediately stung me on my hand! The sting wasn’t actually all that painful, and I had hardly any swelling. But the lesson learned definitely is that if sufficiently annoyed, even the most docile Bumble Bee will take a shot at stinging you. And unlike Honey Bees, Bumble Bees do not have a barbed stinger, so they survive and can sting repeatedly. I’m happy to report that the bird house occupants seem to have accepted their new location, and while I see them coming and going, they have not bothered us in the yard at all. This entry was posted on Tuesday, June 14th, 2011 and is filed under DanTheBeeMan. Both comments and trackbacks are currently closed.